The century plant is starting to bloom. April 12, 2012 and we are there. I look forward to documenting the entire process. follow this developing chapter in another amazing urban garden saga. 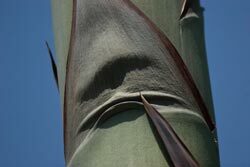 April 12, 2012 – I notice that the Agave Americana, also known as a century plant, maguey or American aloe, is starting to grow a bloom. To watch this spire grow and articulate visit 1 – Something is Happening. 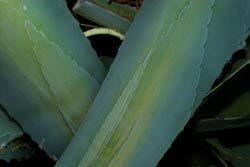 Originally from Mexico, Agave Americana was cultivated as an ornamental plant worldwide. It now grows wild in Europe, South Africa, India and Australia. In two weeks the flower has grown twice in height and articulations on the spire probably indicate where flowers or flowering branches will emerge. May 27, 2012 – Upwards and outwards, above and beyond. Towering above its neighbors the agave dominates the horizon. In the last couple of days mocking birds have started to visit: here they perch, here they sing. Mathematical beauty + natural formulas = fauna success. The ever-present natural thirds and threes emerge and expand. The flower started with three bulbs on a stem that began to grow outwards. Now, those bulbs are becoming their own branches each with three bulbs at their heads. Symmetrical diversity. July 15, 2012 – The pods have started to open. We now know what form the bloom will take. To see the blooming visit 2 – Yellow on Blue. We celebrate another flora fulfilling destiny coded within its seed. 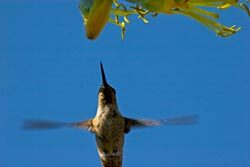 Bees and birds are now circling the agave century plant top Throughout the day there is a good chance you will see as many as three orioles hopping from bloom to bloom. The tall agave blooming century plant attracts a colorful and noisy parade of birds, bees, flies, butterflies, ants and others. July 29, 2012 – For twenty-some years the leaves reached forward upwards powered by inner strength and determination through drought and flood. At last, the crown has gone to bloom. A final chapter has begun. It was interesting to watch this agave bloom. I noticed that the spire shot up and the branches began in a way that the blooms would be higher than surrounding trees and house. Was the agave aware and sensitive of its surroundings? August 10, 2012 – There is no place to go but down. Gravity knows no conqueror. To watch the bloom and spire decay visit 3 – After the Bloom. Blooms become litter caught by a drooping leaf. The constant buzz is no more. bees and birds no longer visit the agave. The buds are drying out. Drooping leaves fill with fallen blooms. There are no ants or flies attracted to these fallen flowers, drying quickly under a hot sun. August 19,2012 – Transformation are underway from top to bottom. Subtle coloring and collection of debris are the current state of affairs. Flower litter decorates leaves and crevices. No longer are the driving forces upward, drooping bottom leaves are close to touching the ground. September 8, 2012 – Today I started to cut the wilting leaves-spears from the agave trunk. The process of removal by man has begun. Up into now when I cut into a leave it oozed a moist gel and surprisingly heavy, loaded with water. Today when I cut dry sawdust is produced. The carnival sprouted up, up up and blossomed into the biggest show on the block. With a tinge of sadness I begin to dismantle this magnificent agave century plant. 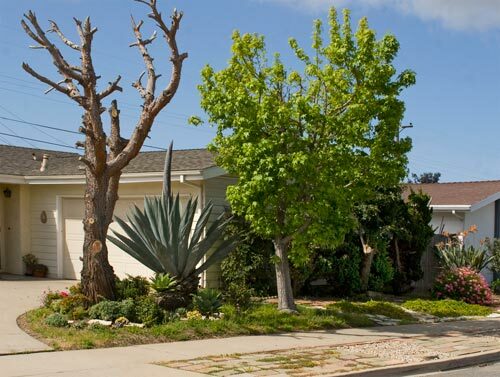 January 8, 2013 – The century plant bloom has been drying out for months. To watch the spire come down visit 4 – Last Chapter, or Is It?. The tall spire is a danger if it were to fall by itself on the house, a parked car, the driveway or a passerby on the sidewalk. It has become time to cut down the spire, hopefully with no unintended consequences. 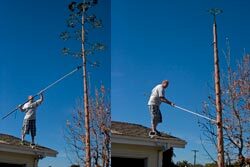 With simple tools, a pole saw and ladder, the goal was to fall the bloom in three sections while minimizing unintended consequences. The top section was cut from the roof and fell into the liquid amber tree. No damage done. The second section cuts started on the roof and finished off from the ground. After repeated sawing, a push brought the section to earth. 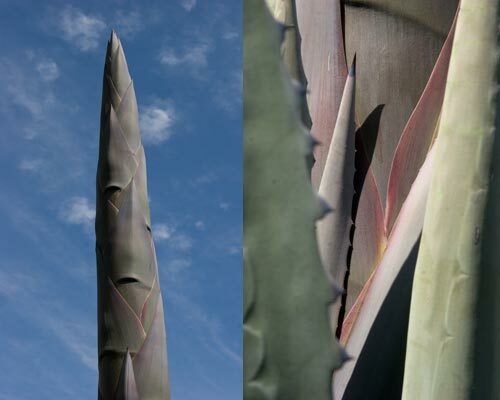 The agave century spire stood 32 feet 3 inches tall. The spire’s girth at its base was 32 inches. Nature is all about change. The century spire was all about continuation by distributing – broadcasting its seeds. There was much to learn watching this agave bloom. 4 – Last Chapter, or Is It?